Embrace artful and creative home décor with this issue of Somerset Home, featuring Melinda Barnett’s hand-painted party glasses and Aaron Prosser’s rustic mail organizer that shows off his wood-working skills. Also in this issue, Niki Meiners creates stunning cement plant holders and paints designs on them in trendy metallic colors, and Heather Patterson creates lovely magnets that are not only made from recycled materials, but can also double as cards to write an inspirational message. 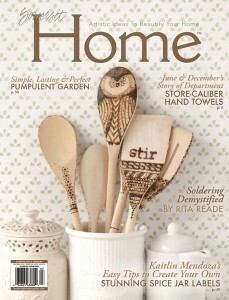 Plus, learn a few tips about screen-printing and cultivating your own style from home accessory designers June & December.